Even though video chatting has been a part of digital lives for years, some people are still not sure if it’s for them. Trust us, with the amount of ways to do it now, everyone should be chatting to their family on the other side of the world as easily as being in the same room. There are plenty of video chat apps out there now that mean you can have a digital catch up with anyone, anywhere, and all for free. If you have the right hardware all you need to do is download one of many app options and you can enjoy high quality video pow-wows back and forth - plus, if you’re on Wi-Fi you won’t even have to pay for that connection. We’ve collated some of the best apps out there right now and paired them with various hardware options for using them, so you can tell which setup is right for yo. From smartphones and tablets to laptops and TVs, there are plenty of ways to get you up and running, and here are five of the best. One of the simplest ways to get chatting is found in Apple’s Facetime. As you’d expect from this brand, the app is a minimal video chat platform that lets you simply tap to call and get talking. 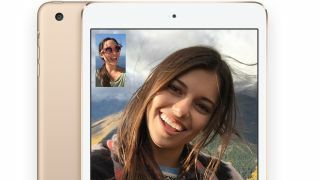 If you have an iPad then the FaceTime app will already be installed ready for you to start using. From within there you can find contacts that are also using Apple hardware, and then it’s a simple as tapping the video icon and the app will make a call to them. As long as the person at the other end has FaceTime on their iPhone, iPad, iPod Touch or Mac then you can chat away easily, cross-platform. Once connected you can chat away for as long as you need in FaceTime camera quality, which is generally 720p (so still HD). A nice thing about this platform, other than the ease and fact it’s free, is the ability to move around on your iPad to show the other person anything you need - ideal for family catch up time while Dad’s away. What better way to video chat than on the biggest screen in the house? Microsoft’s ever-improving Skype app is now available on many smart TVs. That means that if your TV is compatible and has a camera (either built-in or easily added on by you in new models through USB), then you’ll be able to talk face to face with anyone using Skype from the comfort of your sofa. Since Skype also lets you call normal phone numbers, for a charge, anyone is technically reachable. The only downside here is that if you want privacy you can’t just take the TV with you to another room so you may need to hang up a “Stay Out” sign to the rest of the tribe before you get started. With Apple and Microsoft offering video chat solutions, obviously Google has its own option too - and it comes in the form of Hangouts. This allows for calls and video chat from within a browser on your laptop or PC, so anyone else with Hangouts on a computer, phone or tablet can be contacted. Hangouts lets you have multiple callers in one video chat too, intelligently spotting who’s talking and making that video the main one on screen. The app also allows for messaging so you can share photos but - rather brilliantly - also allows for screen sharing. This makes Hangouts a great work tool for sharing on-screen guidance with someone from anywhere in the world. If you’ve got a smartphone (which you probably do) then you have more than likely already have downloaded WhatsApp - and if you haven’t, then get involved as most of the people you know are already using it. The Facebook owned app is immensely popular for typed messaging over a network connection but also offers calling and video chat too. Since so many people already use WhatsApp it’s a great way to video chat to anyone phone to phone - and it’s perfect for making voice calls when the cell signal isn’t up to scratch. Just make sure you’re on Wi-Fi or it could end up costing you in network data charges. If you were part of the wave of gamers that bought a Kinect and have left it collecting dust ever since, get out your feather duster, as you can video chat using your Xbox and a Kinect. Video Kinect - as it’s unimaginatively called - works between Xbox consoles using Kinect as the camera (so, yes, the other person will also need an Xbox and Kinect, but that’s more common than you’d think). Ideal for a pre-gaming battle planning sessions with your online amigos, then.